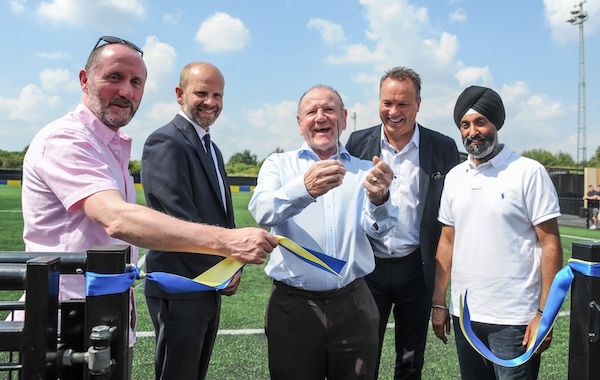 A state-of-the-art third generation (3G) artificial grass pitch (AGP) was officially opened for Sporting Khalsa Community Facilities Ltd today (Saturday 14 July). Their new facility, at the Aspray Arena in Willenhall, was made possible thanks to investment from the Premier League & The FA Facilities Fund – delivered by the Football Foundation. The official opening of the new all-weather pitch took place during a pre-season friendly between the site’s main user, Step 5 club Sporting Khalsa FC, and Hereford FC. They were able to take advantage of the brand new pitch, which has been upgraded from the grass stadia pitch. The original surface was prone to ‘cutting up’ during matches. Sporting Khalsa Community Facilities Ltd. were awarded a £579,564 grant from the Premier League & The FA Facilities Fund towards the project.They also received £75,000 from Sport England. The organisation worked alongside the Football Foundation and the Staffordshire FA to compile a five-year Football Development Plan, which is a vision of how sport will be played on site with an emphasis on increasing participation. Founded in 2000, the Football Foundation is the largest sports charity in the UK funded by the Premier League, The FA and Government, via Sport England. It develops new and refurbished grassroots sports facilities in order to improve the quality and experience of playing sport at the grassroots level. Since it was launched in 2000, the Foundation has awarded 18,000 grants worth more than £638m towards improving grassroots sport, which it has used to attract additional partnership funding of £841m – totalling almost £1.5bn of investment into the grassroots game. “Continuing to improve access to high-quality facilities like this one is a key aim for the Premier League, The FA and the Government.Delivered by the Football Foundation, their funding supports projects for clubs and organisations all over the country and is helping to boost the number of people benefiting from sport through better facilities.